Since my main Mac is a MacBook Pro with a 27-inch external display attached, I’ve grown used to having a lot of screen real estate and have wished for an external monitor small and light enough for travel since time immemorial. 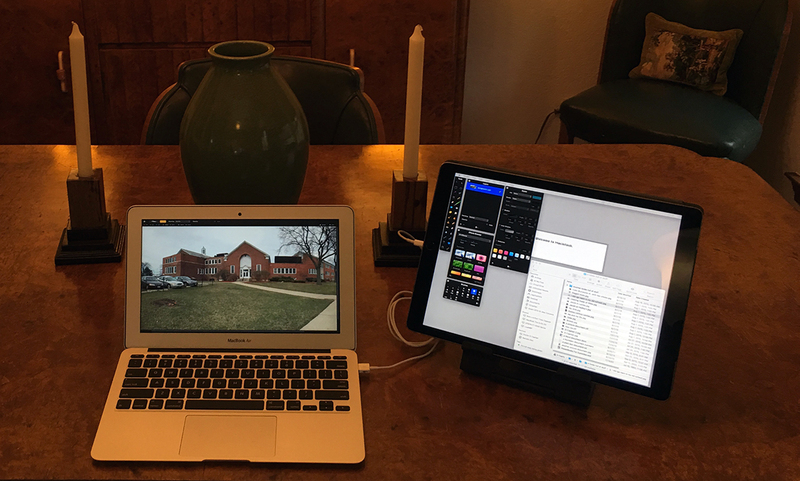 I finally found one created by ex-Apple engineers that’s called Duet Display and it transforms your iPad (or iPhone or iPod touch) into an external display for your Mac. Just launch the Duet Display app on your iDevice, launch the helper app on your Mac, and then connect your iPad to your Mac with a Lightning-to-USB (charging) cable. Your iPad will now behave like an external monitor, which means you can use the Displays System Preferences pane on your Mac to change its resolution or alter its spatial relationship to the Mac display. Duet Display more than doubles my available screen pixels! Duet Display is awesome, doubling my screen real estate without lagging, flashing, or other issues. It’s so good I won’t leave home without it. 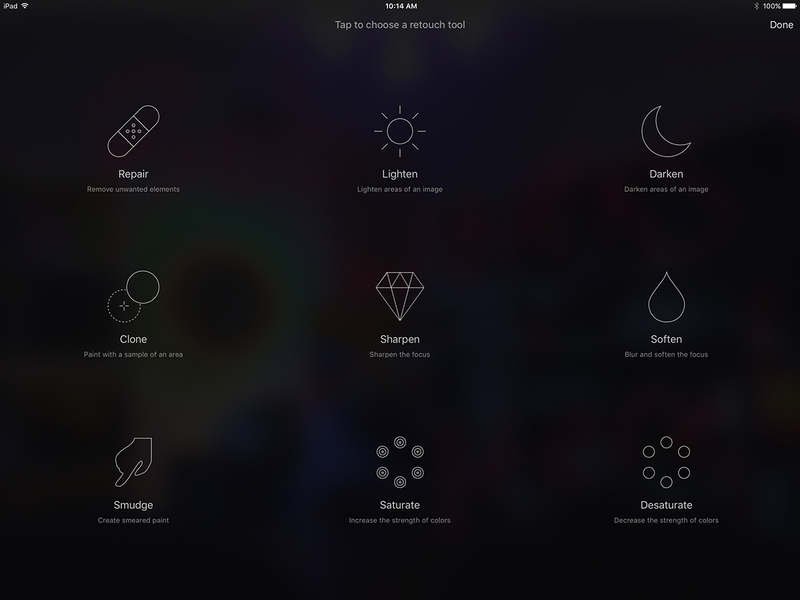 Pixelmator is my go-to image editor on the iPad or iPhone. It’s amazing for retouching photos, while including a full set of painting and drawing tools as well. Its single-tap presets make it simple to correct flaws; its repair tool is far more capable than Apple’s Photos app; and its layer controls are as good as or better than any other iOS app I’ve tried. And it opens, edits, and saves popular file formats including Photoshop (PSD), JPEG, PNG, and more. With its filters, brushes, levels, curves, and dozens of other high-end desktop image editing features, if you can’t fix it with Pixelmator, you probably couldn’t fix it with anything. I’m the kind of guy who likes to buy a guidebook when I travel and I’ve got dozens of travel guides in my iBooks library to prove it. They’re OK for electronic renditions of printed books, but I’ve always wished they were more immersive and interactive. I recently discovered National Parks by Chimani, which is the most immersive and interactive travel guide I’ve seen. 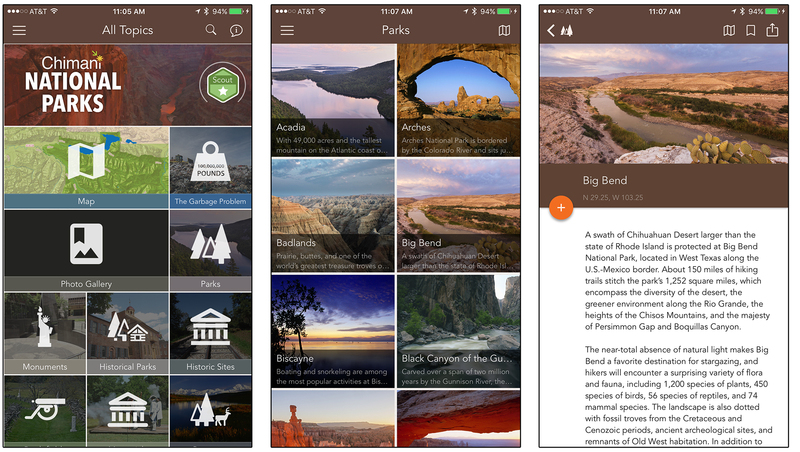 With a clean, easy to use interface and lightning-fast searches, this app makes it easy to plan, navigate, and discover our national parks. Chock full of useful information, it’s thoughtfully designed to work with or without a network connection (including its maps), and provides detailed, useful information on more than 400 national park units. Best of all, it’s completely free and won’t pester you with in-app purchases. Chimani National Parks is beautiful, immersive, interactive, and best of all, completely free! Duet Display. $15.99 (but currently on sale for $9.99). National Parks by Chimani. Free.